This is the first installment of a 3-post series named “Content Ideas for your Franchises”! In each post I’ll go over some topics specific to that franchise that can help them get started with a blog. In this one, I’ll go over some ideas for content if you own or are part of a Quick Service Restaurant franchise. So, let’s get to the post at hand! As you may know by now, content is king and it should reign all over your franchisee sites. This is no exception for QSR franchises. You may think that it has nothing to do with your line of business but if you want to have a successful online marketing strategy, you’ll need some good content on a regular basis. If done right, this approach can be extremely helpful for SEO (to rank higher in those search pages) and for lead generation (and who doesn’t want that?). Need more reasons? A regularly updated blog with relevant content generates 7 times more traffic than a static page! (I kid you not). And in this day and age, with the amount of competition there is in the QSR business, you need to leverage on any opportunity available. If you still need a little bit of a push, go through the ideas in this post to get the content ball rolling! Obviously, there is some content that you can’t miss in your franchisee sites! Even though they may seem a bit obvious, they’re still worth mentioning: your phone, address, service hours, menu, specials, reviews, images, etc.. These need to be in your site before even thinking about moving on to blogging or posting content on a regular basis. If you want to learn more about them, click the link above! Content Ideas for your QSR Franchise! Some may think that sharing recipes is bad for business, or that people aren’t interested in them. Nonetheless, they can be a key piece of information that visitors may really value. Even if they don’t try to cook your dishes themselves, they may be curious about them. Remember that, even though you share your recipes, you still have something to offer: because by going to you, they get the “cooking and cleaning” part off their shoulders. Plus, by showing a recipe, you can get them interested in trying your dishes! If you want, you can even share recipes to meals that complement your products. 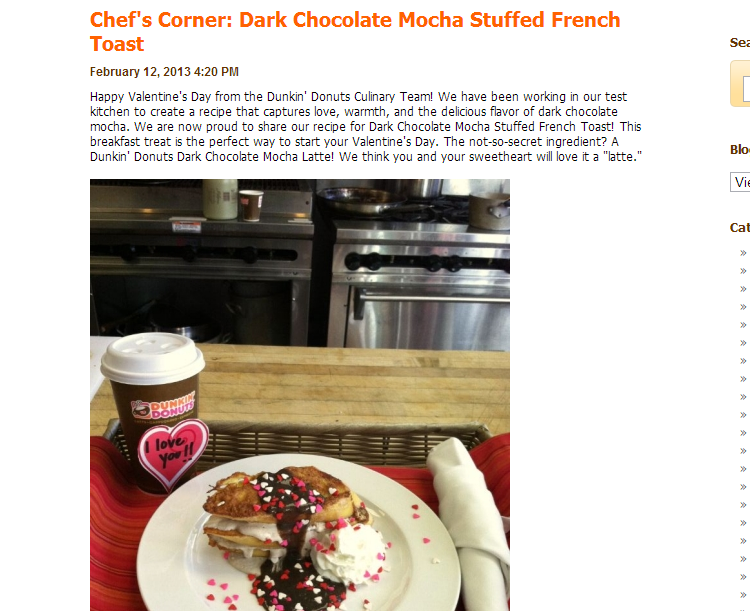 Like in the example below, this dish can be perfect to try it with one of this qsr’s coffees. Think outside the box and come up with ways to engage your visitors with your food! Along these lines (more of a tip than a recipe), posts about how to correctly wash a pan or remove coffee stains from a carpet can be great follow-ups because they still have to do with your line of business, while addressing a common problems that happen when cooking! More than ever people are worried about the nutritional value of food, how to have a balanced nutrition, is the food organic, is it customizable to meet my nutrition needs, etc. By writing up a post about “How to customize your meal at (Your Franchise) so it’s low fat”. You can give them tips like: ask for light mayo and only spread it on one bun. Let them know how much calories they’re saving and where your products are coming from. That’s a sure fire way to steer away from the stigma that fast food is bad for you. Furthermore, people are interested in getting fit and exercising (which is something that they relate to eating). By including a “This Meal Gives You Energy to Do This” post, you are giving the visitors the information they want. A balanced meal and fitness should be a part of every person’s life so give them a little push in that direction. These are the easiest post because you draw inspiration from your customers. By being open and letting them ask you questions, you are engaging them with your service. Furthermore, if you answer these questions in blog posts, you’ll be informative and caring about your customers’ concerns while being relevant and relatable. Remember that customers in different locations may have different questions, so go the “localized content” way. On the other hand, you can ask questions to your customers! A poll can be great for getting your customers to take some kind of action in your site. Or, you can do a simple riddle like in the image below. 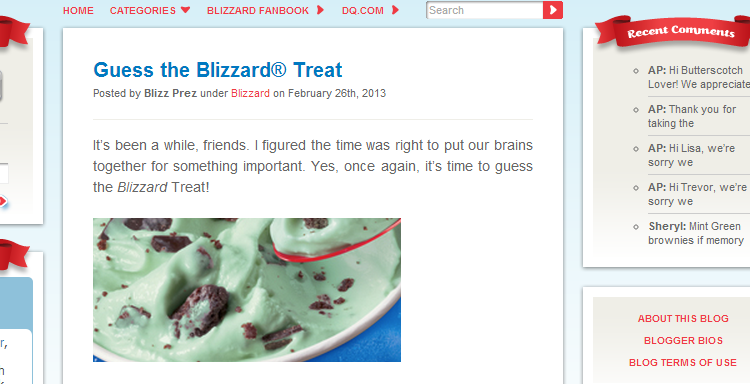 A quick game like that can let you know how many people are reading and are engaged with your product enough to “Guess the Blizzard Treat” (for example). Trends are great to write about because they are happening NOW. Think about customer trends: what are most of them ordering? What do they drink to accompany their drink? Leverage on this information and make some suggestions to other customers. Try to encourage them to give something new a chance! Another thing you can do is find out what trends are going on in the world. If the “Harlem Shake” (for example) is a big trend, you can jump on the train and show your customers that you’re a fun and easy-going franchise. Take what’s working (and getting visits) in the world and use it to your advantage! This is a big one! People are involved with their community and you should be too. A post about a community fair or of a parade that will be happening in your city will give your visitors the sense that you’re interested in and that you’re part of what they’re going through. 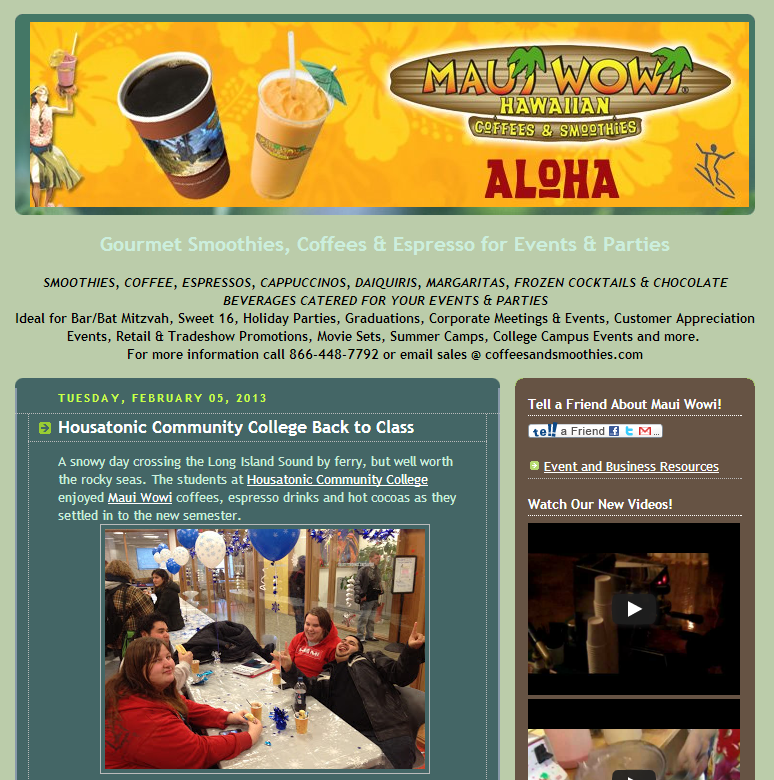 In the example below, you’ll see that this franchisee site published a post about a community college going back to classes. Plus!, they put up images of their customers and members of their community. That’s a great way to get some extra visits! Another way to get your visitors interested in your blog and in your products! By handing out coupons in exchange for a correct answer to a question (see the tip about the Q&A! ), you’re getting your readers involved with your posts. In the example below (even though it is Spanish), you can see that the blog mentions a discounts for big families in this franchise. An easy answer for content! Be it images of your customers, of an event (with a small text to go along with it), to “meet the team” or “meet the place”, a gallery can be a great way to put some visual references of who you are as a company! Sometimes, a friendly recommendation about a book, article or video about something related to your franchise can do for an interesting and engaging post. Did someone mentioned your franchise in their publication? Did you just add a new item to your menu? Keep your visitors in the know of what’s going on with your business. They’ll probably feel that they’re connected with what’s happening and that they’re part of their community. It’s a quick and easy way to include content that is relevant to your specific franchise! Extra Content Tips for your Franchise! If you’re still looking for ideas, go to your competitors: by reading what they’re doing and writing in their blogs, you’ll get some good ideas of how to approach content. Of course, you’ll need to make them your own! If you want, and to give it a more interesting spin on content, you can, instead of written blog posts, include a video once in awhile about any of these topics (or even some graphics). For more tips, go to the “Content Solutions” post. Content is one of the most important elements in your franchisee sites, no matter the industry you’re in! Don’t take it for granted and use these easy tips to create relevant local content that engages your visitors and creates leads generation. With these, a good service and good products, you’ll be ready to create a base of returning customers to your franchise! If you have any questions about this post, or anything else regarding Empowerkit, feel free to ask! We’ll be happy to help. If you’d like some content ideas for a Professional Services franchises and/or for a Cleaning/Restoration franchise, click on the links! If you’d like a post about content ideas for other types of franchises, let me know in the comment section below!